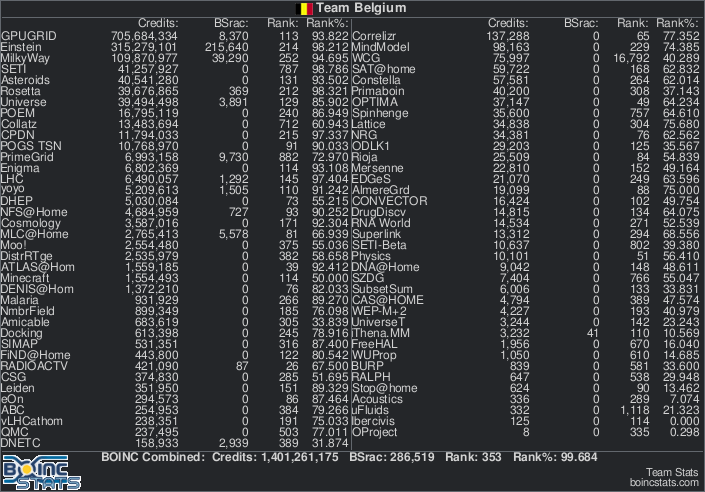 Welcome to the site of the unofficial, independent "Team Belgium" for the BOINC grid computing project. As the founder of the team, I'd like to invite you to participate in it if you have spare CPU and/or GPU time to offer so that we can solve problems that require an immense computing power. Without the help of many volunteers all over the world, it would be extremely difficult and costly for researchers and scientists to tackle down some of our greatest problems and questions we currently have. However, this doesn't have to be the case, as now you too can participate and help out by running the BOINC client on your computer. Most of the time, your CPU and GPU are heavily underutilized so instead of letting them spin idle, the BOINC client will use their compute power for the greater good of human kind by computing data packets it recieves from the project's servers and sending them back for analysis by scientists... Who knows? Maybe one day your computer could be involved in the discovery of a new Pulsar, or be part in the discovery of the cure for cancer or AIDS? BOINC offers a vast list of projects where volunteers can choose from and participate in based on their interests. So, if you have some spare processing power to offer, please join me and the many others in the search for answers and solutions. Copyright © 2010-2019, Team Belgium.